The past few days have been busy ones for air traffic controllers who handled several flight diversions on U.S. airlines due to disruptive passengers. On Thursday, Delta Airlines flight 188 from Pittsburgh to Paris was landed in St. John’s, Newfoundland after a passenger started spouting off about Muslims. Marcus Miller who was sitting next to the man told a Pittsburgh news reporter, "You know, he kept referring to Muslims and I just felt like, if this guy snaps, we're in trouble." That same day, Muhammad Abu Tahir, a passenger on AirTran flight 39 from Atlanta to San Francisco was said to have gone into the bathroom and refused to come out. 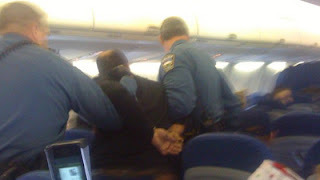 Fighter jets were dispatched and the plane was landed in Colorado where Mr. Tahir was arrested. Hawaiian Airlines diverted two flights in two days. On Flight 39, Joseph Hedlund Johnson, became agitated and reportedly gave a note to a member of the flight crew that was interpreted as threatening. Like the AirTran flight, U.S. military jets were dispatched to accompany the Hawaiian plane to an emergency return to Portland, Oregon. Another Hawaiian Airlines flight from Las Vegas to Hawaii landed in L.A. after a passenger reportedly sexually assaulted the woman sitting next to him. Flight 253 passenger Kurt Haskell, also reported that even before the plane departed Amsterdam, he saw Mr. Mutallab in the company of an older Indian gentleman, who was telling the ticket agent that Mr. Muttallab was a Sudanese refugee and should be allowed to board the airplane without a passport. I know, I know, it sounds incredible. But Mr. Haskell, an attorney in suburban Detroit seems reasonable. Perhaps his account is at least worth checking out. In the two weeks since, the Detroit event, we’ve seen the closing of Newark Liberty International Airport for nearly seven hours after a man identified as Haisong Jiang slipped through security reportedly so he could accompany his girlfriend to her plane. The Transportation Security Administration told ABC News that across the country since Dec. 14, there were "37 incidents at airports that involved a checkpoint closure, terminal evacuation or a sterile area breach." I find that number startling. Do the math, that’s almost two a day. Then we learn that the delay in confirming that a man had indeed breached security was because the cameras at Newark airport were running but not recording. Now we have a virtual epidemic of passengers, who are not just making pests of themselves they’re causing planes to divert. Patrick Smith, who writes the Salon column, Ask the Pilot, tells me "An international diversion can cost hundreds of thousands of dollars once you account for passenger misconnects, added crew costs, refueling, and the downline logistical problems that result when an airplane is unexpectedly re-routed." After the movie Jaws came out in 1975, the number of shark attacks reported in the newspaper jumped. Were more people being attacked or was the media just reporting more of them? This is the “jaws syndrome” says Jim Schembari, a veteran journalist at The New York Times. That could be what’s going on here. Northwest flight 253 was the news equivalent of a feature film and justifiably so. The line between what happened and what could have happened is too narrow for comfort. I can’t help feeling that these incidents are not isolated and unrelated. I wonder how much of what’s going on is part of a deliberate program to test the response of flight crews and probe for weak spots in security. Airline pilots are telling me the information they're getting about their "discretionary power" as inflight security coordinators is either unclear or non existent. One pilot described the memo he saw from TSA as "uninttelligible nonsense." Another told me he's walking through the cabin before departure just to eyeball his passengers and make sure they're all acting "vaguely normal." If you think Homeland Security seems a little less-than-secure these days, take a number. You’re not alone.